★30 Blubs & Large Cover Rang: 30+3 spare blubs (most others brand with 18-25 bulbs), all bulbs are replaceable; 10.7m ultra long cable, to cover a large area as you need. Besides, each socket designed with a small hang ring above, making it easy for installation, and stable for windy weather. 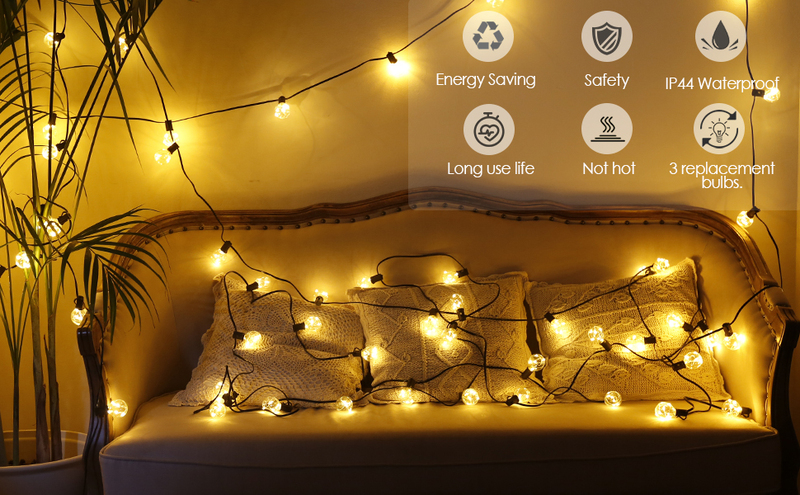 ★Safety Guarantee: MYCARBON LED String bulbs with the low power, no worry of heat even after long times use, the cable is made of brass triple core wire and heat-resistant insulating durable rubber, match with a Low voltage power adapter, ensure your family safe. Whether in the office or home, indoors or out. From bright, architectural floor lamps for any room, to glowing strings of delightful vintage bulbs casting a magical ambience for your patio, MYCARBON lights your way. The bedroom doesn’t have to be dark for the string lights to be useful, they can easily do their job during the day as well! They quickly blend in with the background, the yellow lighting becoming more subtle but magical nonetheless! Each socket designed with a small hang ring above, making it easy for installation, and stable for windy weather. Convenient to fix or place it anywhere as you like. The string lights built with IP44 waterproof level. Its cable was made of high quality rubber material, features weatherproof heavy-duty and flexible to withstand all kinds of weather. The diameter of the light bulb is only about 4cm, save more space than others. Easy to fix one bulb in seconds, do it by yourself and enjoy the fun! 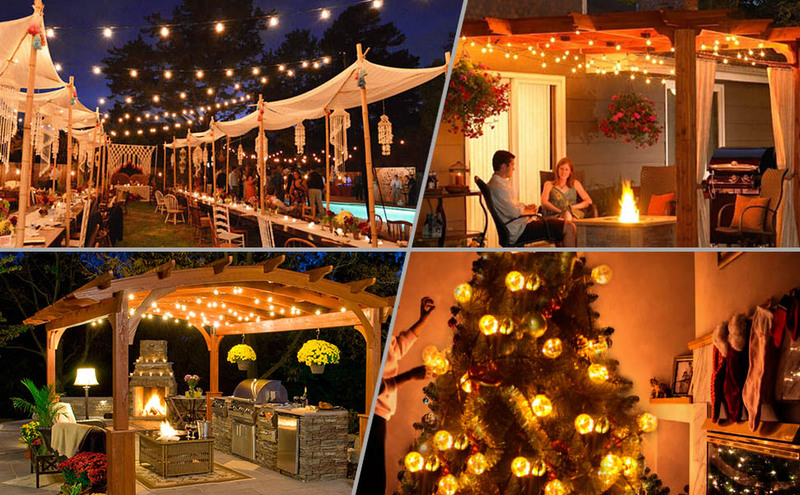 MYCARBON Outdoor String Lights provide endless options to transform your backyard, indoor or outdoor space into something magical. They will add a touch of elegance to any outdoor space and are great for all occasions, including but not limited to weddings, barbecues, birthday parties, and family reunions. The lighting offers the safety element with the aesthetic quality when it illuminates the areas which are dimly lit.